I've been reading through current and past threads on ball machines and occasionally see references to the difficulties in getting the machine and other tennis gear from vehicle to courts and back again. 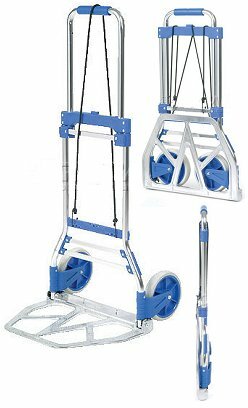 So, I've been doing a bit of research into portable (foldable) carts, dollies, and hand trucks that might be suitable to use when transporting ball machines and other gear to and from a vehicle when taking the machine out to practice. And, it's not only getting the machine back and forth, but all the other things that might be part of a session on the courts. Granted, you won't need to take all of this stuff out every time, but who knows? You might want to. And the greater the distance you've got to go from vehicle to courts, the greater your need might be for something like a cart to ease the pain of moving everything back and forth. Criteria for the cart/dolly/truck would be stability and portability (and by portability, will it fold up and fit easily into a vehicle that's also carrying a ball machine?). Here are some links to products that I think could be considered. I'm also looking for other suggestions (or feedback on these). This one worked really well for me. Easily fits an I-SAM Portable ball machine and a 75-ball ball hopper, side by side. Then you can put a large tennis bag on top. Great for other uses as well, like moving. Also check out this Froogle search on the 4401. Nice suggestion, and thanks for the link. I have a folding handtruck along the lines shown in at this site, http://www.handtrucksrus.com/folding.aspx. It works well for carrying my TT 4+ and a large bag of tennis balls and it folds to a fairly small size. I don't have to deal with any curbs or steps transporting my stuff from my car to the courts at my tennis club but I wanted to get something with fairly large wheels since they would be able to accomodate curbs or steps easier than a cart with small wheels. I don't have to deal with any curbs or steps transporting my stuff from my car to the courts at my tennis club but I wanted to get something with fairly large wheels since they would be able to accomodate curbs or steps easier than a cart with small wheels. Good point about dealing with curbs or steps. That's one of my concerns, too, and has me leaning toward dolly-style carrier rather than a strict 4-wheeler (unless the 4-wheeler has big enough wheels to accommodate a curb or steps -- but then it's less likely to be truly portable or foldable for easy transport in a vehicle). I have a couple of courts where I play and practice that are essentially handicap accessible (ramps for access), and those would easily be accessed with a cart with smaller wheels. On the other hand, I play at a couple of other places where in the very least I have to go over a curb (or go way around) and I'd like going over curbs to be as smooth and easy as possible. Another consideration is wheel size and construction. Generally, the larger the wheel, the smoother the ride. Lots of the dollies have larger wheels for smoother rides. Carts with larger wheels tend to be on the bulky side and may not be as portable as would be desired. I think it's hard rubber or maybe a composite. It makes a little noise when you pull the cart over a pebbled surface, but very quiet over smooth surfaces like the tennis court. The platform itself is thick industrial plastic. I have the version with larger wheels and a straight handlebar. One of the images in the search results show small wheels, and the first several images show an angled handlebar, which is confusing to me. Maybe there are different versions of the 4401. Yeah, I figured you were using the version with the larger wheels. The one with the smaller wheels has MUCH smaller wheels, so I didn't think that was the one you meant. But on the wheel material, it was difficult to tell from either the description or the photos. And I do like the idea of the industrial plastic platform (weight reduction, etc.). seems like the most promising. I'm wondering how something like the link below could work? wouldn't you be afraid of the machine falling off? Thanks for researching and compiling these options/examples! It takes me 30 minutes and several trips back/forth - to/from car (Infiniti QX56 land yacht) to haul all the regalia I like having and feel necessary to perform an effective practice session with my ball machine. One of the other major and bulky/clunky items I think was left out on original post that is essential and hugely problematic was "Ball Collection devices, pick-up, hoppers, tubes, etc." It would be nice if rolling transport "cart" or device could also double as a hopper/basket for teaching lessons, feeding, practicing one's serve, etc. Prolly too much to ask.....but it would be way cool if "cart" could also be used to elevate machine high enough to "serve" so as to practice one's "return of serve" - which many say is the "2nd most important shot" in Tennis! More latter, but this is a critical issue/aspect that I need to figure and resolve. I had one more similar to your second example when I owned a Tennis Tutor. I made a video on YouTube and I still get messages regarding it. The cart was something I got at either Ace Hardware or Harbor Freight for $30. I used it with a Silent Partner old box style machine too. I now have a Lobster with big wheels so the cart is not needed. It definitely made my life easier and I could fit it all in the trunk of a Honda Civic; 120 balls in a Gamma tub, 75 ball hopper, ball machine, & cart. thanks for your reply! Are you ever afraid that the ball machine would fall off using the cart? That would be my main concern with this set up. Bungee cables work for me - it's not going anywhere.